Most GNSS modules out there, designed for recreational use in everyday consumer devices, are GNSS-L1 modules. However, they do not necessarily offer the characteristics needed to establish the precise position of an object on the territory with an accuracy of just a few centimeters. To achieve this level of precision using a GNSS-L1 receiver, you need a device that records GNSS observations on an easily accessible medium (a file easily transferable on a PC). Moreover, you must ensure that these observations include measurements for pseudo distance, the carrier phase as well as Doppler measurements (on the L1 band). Some devices will provide you with access to these observations, but not all of them will include carrier phase measurements, which makes it impossible to calculate a position to the nearest centimeter. Good carrier phase measurements are essential for calculating centimeter positions. Lastly, your device must also be equipped with an external antenna connector so that you can use a quality antenna (mounted on a survey pole). In addition to improving the quality of the signals received, the external antenna allows to easily connect the antenna’s phase center with the point of interest that must be determined to centimeter precision. What is an affordable L1 precision receiver? Most GNSS manufacturers offer quality GNSS-L1 receivers (Trimble, Leica, Topcon, Javad). They have all the features required for centimeter-precision positioning. However, they are generally very expensive, and force you to stick to a relatively hermetic ecosystem. By “affordable”, we mean devices based on the technologies developed by uBlox, NVS or other manufacturers that offer quality technology at equivalent prices. These are small GNSS modules providing access to the measurements required to calculate accurately to within one centimeter. These modules cost a few dozen US dollars. Obviously, once integrated into a handheld computer or in a specific housing, these units can retail for between US$1,000 and US$2,500. 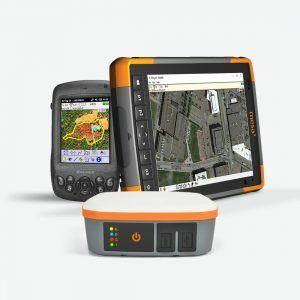 For this price, you will receive a GNSS-L1 receiver, which will allow you to achieve centimeter precision; in certain cases, it will include a handheld computer (in the case where the GNSS module is integrated into the handheld computer). Performing measurements in static mode is the easiest way of achieving centimeter precision positions using a GNSS-L1 receiver. This involves setting up an antenna 15 to 30 minutes above the points of interest to acquire sufficient data to carry out calculations. Once your data has been transferred on your desktop computer, they will be merged with those from a reference station using post-processing software to determine the position of your points of interest to centimeter precision relative to the position of your reference station. The reference station may be a GNSS-L1 receiver that you are operating on a point whose coordinates are known, or even a station in one of the many networks existing on the territory. One constraint is the distance between your points of interest and your reference station. For GNSS-L1 receivers, it is recommended not exceeding 20 kilometers. Beyond this distance, GNSS data contain atmospheric errors that are impossible to model in order to achieve centimeter precision. In general, it is recommended that you increase your observation period for longer distances. Normally, between 15 and 30 minutes are enough to achieve centimeter precision in static mode. In centimeter positioning, knowing the exact position of the signal reception within your antenna (antenna phase center) is important when concerned about the altitude of our points of interest. These antenna specifications must be entered in the post-processing software in order to apply the appropriate corrections. Lastly, for a GNSS-L1 receiver, positions in static mode are only obtained with GNSS post-processing software. Static positioning results are rarely available in real time. Centimeter kinematic surveys, commonly known as “Stop and Go”, “OTF” or “PPK” with GNSS-L1 receivers require a little more care. It is important to understand that with a single frequency, certain constraints apply in order to achieve centimeter precision. However, with the right equipment, several use cases are perfectly suitable. It is necessary to have continuous GNSS observations from epoch-to-epoch on at least five satellites for a minimum period of 30 to 40 minutes in order to collect enough data to correctly resolve phase ambiguities. Typically, data are saved at an interval of one second in the field. With this interval, it is practically impossible to detect cycle slips with a one-cycle resolution when the antenna is moving. Normally, we must rely on the capacity of the GNSS module to provide this information for each period. Firmware normally has access to very high sampling rates, allowing to detect cycle slips on the signal for each satellite and include this information with the observations recorded by the data collection software (firmware can detect them, but cannot correct them). The second point is important for reaching centimeter precision. Discontinuity in observations is generally due to obstructions around the antenna, which block the signal and create several cycle slips. With a GNSS-L1 receiver, environment obstructions must be avoided as much as possible. To ensure centimeter precision, the recorded data must contain periods of at least 30-40 consecutive minutes without any discontinuities for at least five satellites. If your post-processing software allows to use known coordinates (during the survey) to initialize the phase ambiguities, this period can easily be reduced. Moreover, if your data collection software can detect signal discontinuity, the user can easily reinitialize on a point in the vicinity to relaunch the centimeter survey. In the end, it is understood that GNSS-L1 receivers (correctly addressing the aforementioned issues) used in kinematic mode must be employed in a relatively unobstructed environment. In this case, these devices, combined with the right antenna and right post-processing software will provide results equal to those achieved using the expensive GNSS L1/L2 receivers. Use in open environments such as farmland or bodies of water are examples of environments designed for the use of these devices in kinematic mode. To illustrate this, we have carried out site field surveys using a GNSS-L1 receiver based on NVS technology (Allegro 2 from Juniper using a NV08C-MCM module, GPS and GLONASS) and a uBlox M8T receiver (GPS and GLONASS). We carried out surveys in both static and kinematic modes. These surveys were conducted near Effigis’s offices in Montreal on a network of points (10) whose coordinates were established beforehand using L1/L2 receivers (LandPAK from Navcom, GPS and GLONASS). 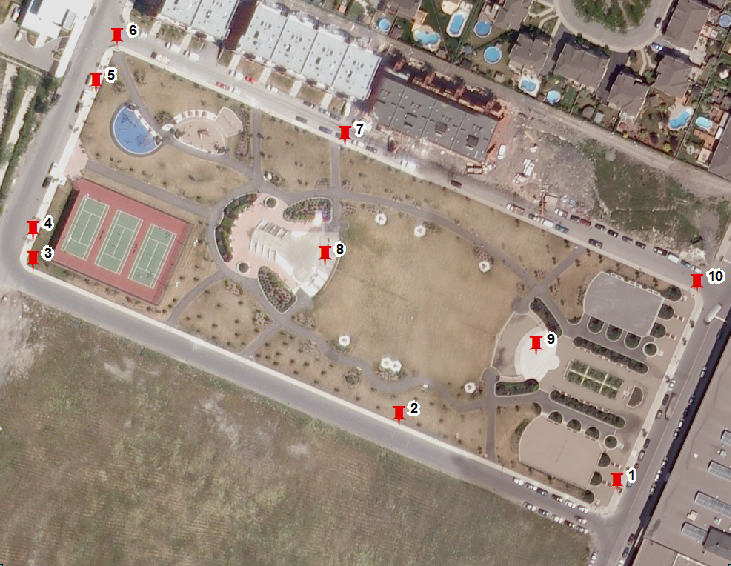 The ten (10) points were measured at two different times (2 times, 30 seconds of observation) using a double-frequency GNSS system (L1/L2) in combination with data from the Montreal station located 6 km from the survey. Positions were obtained using post-processing software. The results in Figure #1 are from adjusting the two determinations (two independent surveys). The standard deviations obtained reflect the typical precision obtained during a survey using a surveyor’s staff (centering at +/- 0.5 cm). We selected five reference points that we occupied for 15 minutes (at an interval of one second) with the GNSS-L1 receiver using the NVS module (a single occupation per point). Antennas were kept in a fixed position using a surveyor’s rod) and a bipod mounting. The reference station, used to post-process the data, is located 6.5 km from the test site. Table #1 presents our results for positions, the related standard deviations and the discrepancy with respect to the reference points. 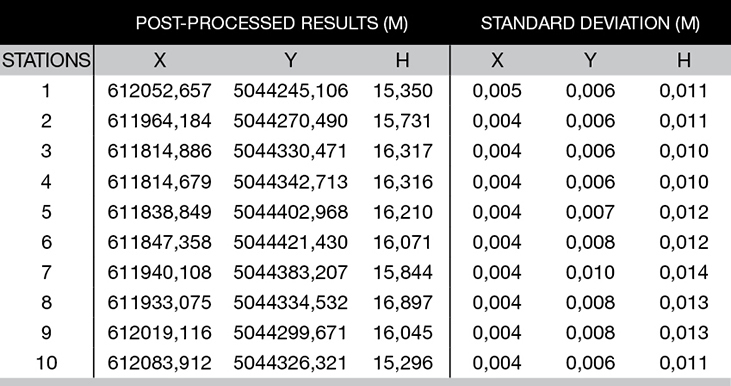 The results presented in this table show us without a doubt that our GNSS-L1 receiver can easily determine centimeter positions with 15 minutes of data by using a reference station located within 15 to 20 km. All positions were obtained during post-processing. The discrepancies presented here obviously include imprecision in the reference network, which is probably in the range of +/- 0.5 cm. We carried out a survey of 37 consecutive minutes using the NVS (GNSS-L1) receiver. During this period, we measured at two different times each of the points of the reference site (2 times 30 seconds of observation). Table #2 presents adjusted points (from our two determinations), the standard deviations obtained from the adjustment as well as the discrepancy with the reference positions obtained using the L1/L2 double-frequency receiver. We repeated the same exercise using a uBlox M8T receiver. The survey was spread out over 36 minutes. The points were also measured at two different times, for 30 seconds. Table #3 presents the adjusted points (from our two determinations). The information presented is the same as in Table #2. Some readers may be surprised to see that the discrepancy from the reference points is in the order of the centimeter. Admittedly, a handheld computer, equipped with a receiver worth only a few dozen dollars, may relatively easily achieve the precision of a costly bifrequency receiver when used correctly. Of course, this survey was also carried out in a relatively unobstructed environment. Is a centimeter position from a GNSS-L1 receiver as precise as that from a GNSS L1/L2 receiver? In fact, when an L1/L2 receiver is used to calculate positions within 10-15 km from its reference station, most software applications (in RTK or PP) only use Band L1 to reduce the noise in the signal. This is simply to improve the quality of the estimated positions. This is also what is used with our GNSS-L1 receiver since only Band L1 is available. The second frequency (L2) of the L1/L2 receivers is however used to detect and correct cycle slips, even if the antenna is moving. This is the biggest advantage for these expensive receivers. Normally, they are also equipped with a better-quality antenna. Lastly, the fact that cycle slips can be corrected directly on site makes these reliable RTK systems. When the reference station is far from the survey sector (in RTK or PP mode), two frequencies must be used (L1/L2), and under these circumstances, GNSS-L1 receivers are not recommended when centimeter precision is required. However, if the phase ambiguities on L1 are correctly resolved to the closest integer, the precision obtained from a GNSS-L1 receiver is equivalent to that of an L1/L2 receiver when the reference station is located within 15-20 Km from the survey sector. In conclusion, it can therefore be said that a GNSS-L1 receiver along with the appropriate software can be used to determine positions with centimeter precision!